Do you any experience of running a business? Do you have a room to practice from? How much time to you have to work on your practice? Then there’s the more personal side, because marketing your practice isn’t a one size fits all thing. 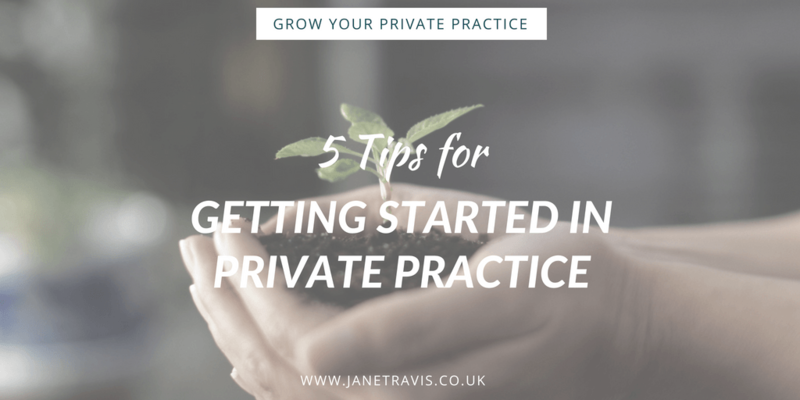 So as you can see, everyone starts at a different place, so getting started in private practice isn't a one size fits all thing. But as long as you are qualified, insured and have supervision, you're ready! You’re going to need a room to practice from. If you have your own room to use, that makes life a lot easier. It doesn’t have to be big, or fancy - ultimately 2 chairs, a small coffee table and a lamp are all that’s really needed. So give the spare room a clear out and a lick of paint and you're good to go! What if you don't have a room available? If you don’t have a room available, it becomes a chicken and egg situation: do hire a room before marketing yourself, or do you start marketing your practice first? I’d suggest you start working ON your business and have a launch date. So get a website/home base sorted (see below), consider a niche and get that prep done while looking for a room. Then when you find a room, you can launch your private practice and use it as a way of getting out there. Contact other local counsellors and ask if they have a room they can share, and if not ask if they have any ideas where to try to find one. Most counsellors help each other. At this point in your private practice career, it's more important to just get out there than find the perfect room. You need somewhere you can send people that provides more information about who you are and who you work with. This could be a website, but you don't have to have a website to get started! If you want to get started right now, here are 2 quick, easy and free ways to get an online home base. About.me is what I used when I first started out. It's basically a one page, simple website and a perfect way to get online. And when you're ready for a website, just put a link to your website on your About.me page redirecting people. Ultimately, you need a website at some point. You'll come across a few counsellors out there that say they’ve never had a website and are busy, and that’s probably true - but we don't know their background. Chances are they're probably established as counsellors and get a lot of referrals. And in fact, I’d recommend you DON’T spend a lot on a 'perfect' website when starting out, because things are likely to change quickly. There’s a saying: If after 6 months you don’t hate your website, you’ve waited to long to launch it, meaning its far, far better to just get something out there and concentrate of attracting clients than take time trying to get your website perfect. Newsflash - there's no such thing as a perfect website, they constantly evolve around the needs of you, your business and your clients. If you have more money than time you can have a website made for you, or if you have more time than money make one yourself. Making a website is probably easier than you think BUT it will take you some time as you’ll be learning new skills. So when you’re putting together your website and feeling frustrated, it's NOT because you're being crap at tech, that’s how we ALL learn. It can feel like walking through treacle. Embrace it, and reward yourself often. Having a niche makes everything far easier when running a practice, but when getting started in private practice, you may not know what your niche will be. Don’t worry, you can still narrow down your focus. Choose something broad that you’re already interested in, like anxiety. You can change or develop this as you go along. Getting out there and being helpful will get you known and remembered. After all, people remember people they meet rather than a name on a screen. Consider your niche and what issues or ‘pain points’ people have. What are their problems, what keeps them awake at night? What do they wish was different? What is their ideal outcome? Put together a workshop around this. You could do something relatively general like communication or self esteem. Then approach groups, communities, charities, schools etc offering the workshop free. 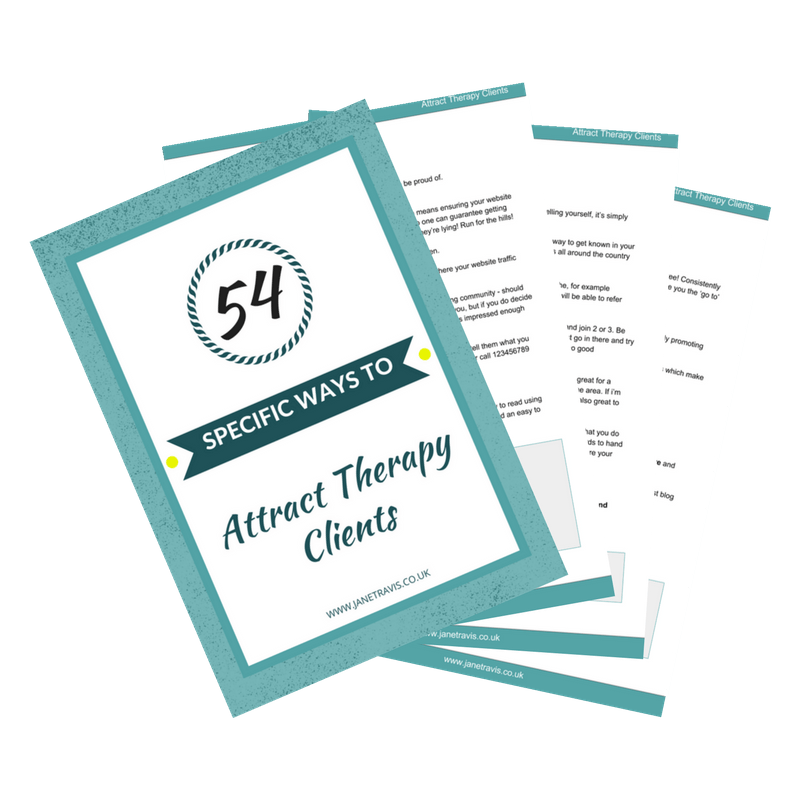 Approach it from a place of ‘I’m a therapist and I’m trying to help people’ rather than ‘I’m a therapist and I’m desperate for clients’. Produce a branded worksheet with your contact details on it for people to take home. Marketing can be complicated, what with websites, social media, advertising, blogging and content creation, email marketing, systems and strategies... the list goes on! But the most simple and effective one is often overlooked, yet it's THE BEST way to get things started. Word of mouth marketing is talking about your practice and getting referrals. Read of Harness the power of word of mouth marketing for an overview, and consider how you will introduce what you do when asked. When you're getting started in private practice, you have no followers, no 'likes', nothing. But you do have YOU, and your passion and that's enough to get started. These are specifically for local business people to meet, get to know each other and help each other out with referrals. It's a great way to get known and make friends. Print some posters/leaflets and get friends and family to put them in their staff room, on shop counters, at hairdressers etc. And get your friends and family onboard, let them know what you do, who you serve and exactly how they can help. Be really clear. And if you're worried about talking about yourself, or - God forbid! - selling yourself, you really don't have to worry, because you simply don't have to sell yourself! Allow yourself to speak with enthusiasm about counselling, about how it helps, about the changes people can expect to experience and the benefits. Be friendly, be helpful and allow your warmth to show through. This will naturally attract people, no sales tactics or manipulation required! It will make them remember you, and therefore you'll pop into their head when they or a friend might need some help. Future referrals just for loving what you do. 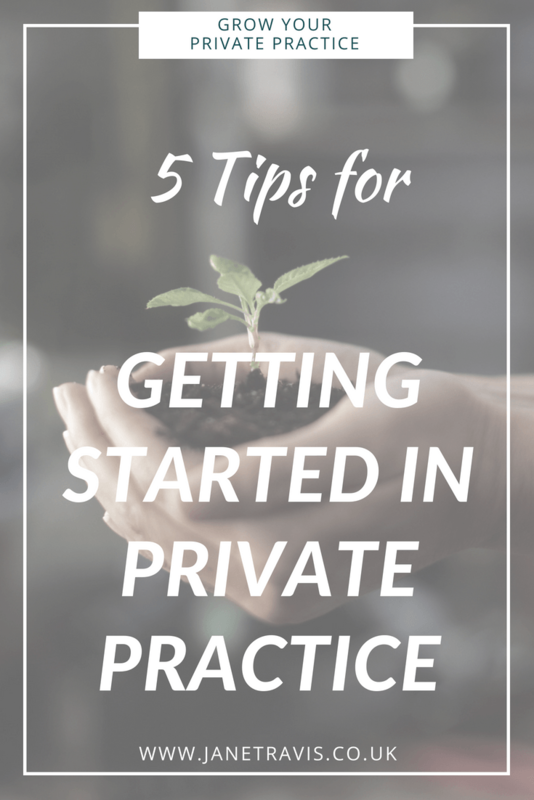 Well there you have it, 5 tips for getting started in private practice. It's an exciting time, the start of something new full of possibility. It's normal to have some fears and doubts, so be aware of them and explore them as they come up via journaling, personal counselling or supervision. But don't ignore them! And don't let them stop you from doing the best job, with the best job satisfaction EVER! And if you want some guidance, come join us in the Grow Your Private Practice Club, for training, resources, help and support.